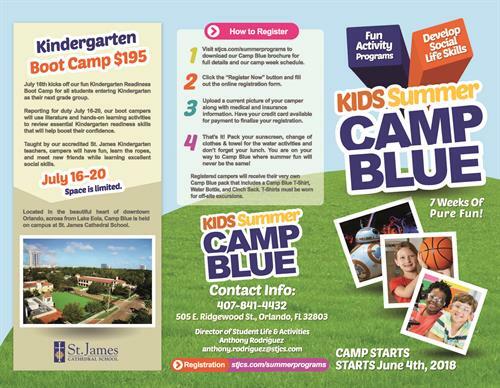 St. James Cathedral School is launching CAMP BLUE! Experience Summer Camp in a whole new way. Each week at CAMP BLUE, campers will experience new enrichment activities, exciting off-campus group excursions at the hottest kid's spots, and an enhanced sports clinic where campers can focus on building their athletic technique and skills. Register today to secure your spot at CAMP BLUE! Summer camp kicks off June 4, 2018.